The PSG vs Bayer Leverkusen UEFA Champions League match is set for Wednesday, March 12, 8:45 p.m. CET (3:45 p.m. ET), at Parc des Princes. The game will be broadcast on Canal+ France in France. The game will also air on Sky Sport 2 Germany, Sky Sport 2 HD Germany, and ZDF in Germany. In the United States, the game will be broadcast on Fox Soccer Plus and Fox Sports 2 USA. Live stream is available on Sky Go, ZDF Zatoo, and Fox Soccer 2GO. Below are two AP articles on the match. PARIS— With Paris Saint-Germain in rampant scoring form and Zlatan Ibrahimovic hungrier than ever for goals, Bayer Leverkusen is facing a tough task in the Champions League. Leverkusen needs to score five goals and keep a clean sheet against one of Europe’s most prolific attacks in order to qualify outright for the quarterfinals. Zlatan Ibrahimovic is in the best form of his career, and will be confident of adding to his 45 goals for club and country this season against Bayer Leverkusen. Added to the spectacular strikes have been some incredible passes, such as the one that released winger Ezequiel Lavezzi for his goal against Bastia on Saturday. As an innocuous-looking ball bounced high near the center circle, normally there would be no danger, but Ibrahimovic showed incredible dexterity to twist his leg up to near shoulder height and volley the ball with his heel into Lavezzi’s path. It was a pass of such precision and timing that, even given Ibrahimovic’s considerable repertoire, it was something special. With Ibrahimovic scoring freely, there seems little pressure on the others to get goals. 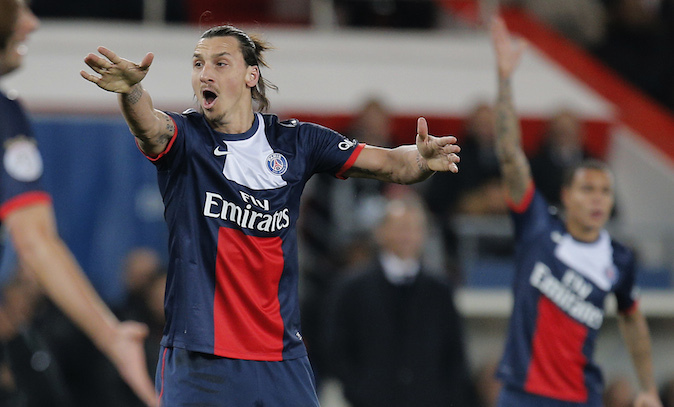 But that might happen one day, and PSG coach Laurent Blanc has urged other players to chip in more. Brazilian winger Lucas has scored only three goals this season, while Italy midfielder Marco Verratti has yet to find the net in a total of 73 club appearances. Lucas almost scored the goal of the season against Marseille recently, running the length of the field and dribbling past four players only to see his shot cleared off the line. “We need to make him practice in front of goal more, he can improve in this area,” Blanc said. Midfielder Blaise Matuidi has been involved in a light-hearted Twitter exchange with Ibrahimovic ever since he scored a spectacular goal for France against the Netherlands last week. PSG right back Gregory Van der Wiel will miss the Leverkusen game because of a recurring problem with his right knee. Van der Wiel, who has impressed with his attacking raids down the right flank this season, will spend the rest of the week in Germany, where he will get treatment for “chronic pains” in his knee, the club said on its website. He is set to be replaced in the PSG lineup by Christophe Jallet, who has returned to the squad after recovering from a back operation. If overturning a 4-0 deficit wasn’t difficult enough, Leverkusen heads to Paris with confidence low after losing five of its past six games. To make matters worse for the visitors, midfielder Jens Hegeler is ruled out for the rest of the season after tearing a ligament in his right ankle in Saturday’s 1-1 draw at Hannover. “You could feel the lack of confidence,” a dispirited Leverkusen goalkeeper Bernd Leno said after the match. With PSG scoring freely — 16 in the past five games — it could be more a case of damage limitation at Parc des Princes. PARIS— Even though Paris Saint-Germain striker Zlatan Ibrahimovic has been hindered by a sore back and could do with a rest, coach Laurent Blanc will not sit him for the Champions League match against Bayer Leverkusen on Wednesday. PSG holds a huge 4-0 lead heading into the second leg of the last 16 and it seems to be the perfect time to give the Sweden striker a night off, but Ibrahimovic is in the form of his life and Blanc won’t even ask him if he prefers to sit out for a game. The 32-year-old Ibrahimovic has 38 goals in all competitions this season and is showing no signs of slowing down. Despite his advancing years, he still looks fresh and has started 27 of PSG’s 28 league games, scoring 23 goals. He has added a further 10 goals in the Champions League — two of those against Leverkusen in the first leg. Ibrahimovic is scoring spectacular goals with uncommon ease and also setting them up in his own extroverted style, such as his assist for winger Ezequiel Lavezzi last weekend. As an innocuous-looking ball bounced high near the center circle, normally there would be no danger, but Ibrahimovic showed incredible dexterity to twist his leg up to near shoulder height and volley the ball with his heel into Lavezzi’s path. Blanc was asked to compare Ibrahimovic’s incredible technical prowess to that of former midfielder Zinedine Zidane, who was Blanc’s teammate on the France team which won the 1998 World Cup and the European Championship two years later. However, with a tough game coming up against Saint-Etienne on Sunday, Blanc is likely to take Ibrahimovic off during the second half against Leverkusen. That also gives Blanc the option of taking Edinson Cavani off the right wing and giving the Uruguay forward some playing time in his preferred center forward’s role.